There’s no doubt that side hustling can help you bring in extra money to meet your financial goals whether they are saving, paying off debt, investing etc. One of the most popular side hustle ideas these days is to become a freelancer. If you have certain skills and resources, you could work one-on-one to provide your services to others for an hourly or flat rate. 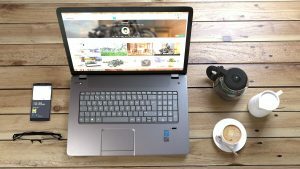 Whether you like to write articles, design graphics, work on computers, tutor, take photos, etc., you can earn money as a freelancer. I personally chose to start freelancing because I love the freedom and flexibility it provides. Being able to set your own rates and choose the day and time you work can seem very refreshing when compared to working a traditional 9-5 job. However, freelancing is not all roses and butterflies. It’s hard work and there are some noticeable disadvantages that might make you want to think twice about starting a freelance side hustle. One of the biggest drawbacks of freelancing is that you often never know exactly how much you’ll earn in a given month. Since you’re working as a contractor and not for a traditional employer, you won’t receive a predictable paycheck every two weeks. You may be needed for a project one month and the next month, the client may not need your help so your income will fluctuate. A client can stop working with you out of the blue or pay your invoice late so if you’re depending on freelance income for debt payoff, for example, it’s best not to count your chickens too early. I always count only the income that has made it into my account because freelancing can be unpredictable and I don’t want to start planning ahead with money I haven’t received and mess my budget up. Yes, freelancing provides freedom, but you often have to work pretty hard in the beginning to build up your network and send pitches to lots of prospects in order to land recurring work. It’s similar to job searching and going on interviews for a traditional job so you may have to be patient in the beginning and build up your portfolio to attract paying clients. In the beginning, I did some assignments for free to build up my network and hired a coach to help me improve my skill set so I could find clients. If you don’t want to make those kinds of investments in the beginning, you might want to weigh your other options for earning extra money. Unlike a traditional job, freelancers don’t receive any benefits like health insurance, a retirement fund, sick days, etc. If you’re just freelancing on the side, this may not be a big deal but one of the hardest parts of freelancing is when you have to meet a deadline when you’re sick or out of town. If you don’t work, you won’t get paid as a freelancer and there’s no one to cover your shift. Freelancers are responsible for paying their own taxes to the IRS quarterly. Since freelancers don’t have an employer to pay a portion of their taxes, they end up paying a little more – usually around 30%. For example, if you earn $500 from freelancing, your client will pay you in full and won’t take any taxes away even though you may have to pay a fee depending on the way you elect to receive your payment (PayPal charges a fee depending on the amount of your earnings for using their service). If you want to set aside 30% of what you earned for Uncle Sam, that will be about $150 leaving you with only $350. When it comes to paying taxes as a freelancer, it’s best to talk to an accountant who can advise you so you don’t end up paying too much or too little each year which can backfire. Some freelancers set aside 30% of their income while others set aside more or less so it’s important to talk to a CPA about your specific situation so the tax filing process can be smooth and stress-free. Saying that you might want to think twice about freelancing doesn’t necessarily mean you should write off the idea completely, but it never hurts to consider other options. If you’re not sure if you want to start a freelancing side hustle, you can always consider these alternatives. Getting a second job will allow you to earn extra money without having to worry about paying extra taxes or searching for clients. If you work during the week, you can always find a part-time job to work on weekends. A potential downside would be not getting enough time off as you could be going to work each day. However, if it’s only temporary, you can try to find a balance. If you want to enjoy the freedom and flexibility of working from home, you can still do that without freelancing. Many employers provide telecommuting positions so you can work from home. You can work part-time as a customer service rep or do data entry work. Check on job boards like Indeed or Career Builder or even look for leads on blogs like Dream Home Based Work for virtual jobs through a traditional employer who can pay you a regular check every month. With these jobs, you may need to work specific hours so you won’t exactly be able to work whenever you want but you will be able to work from the comfort of your own home and avoid commuting to a job. When it comes to deciding whether you’ll choose to freelance or not to earn extra money, carefully weigh the pros and cons regarding all your options. While freelancing was the best decision for me and I was able to turn it into a full-time job, I understand that freelancing isn’t always the best option for everyone. Have you ever thought about becoming a freelancer? Why or why not?